I've always been fascinated by flying machines. If I'm out washing the car and I hear any sort of aircraft, I'll point my eyeballs skyward to check out the equipment. Prop-driven fixed wing, jet, helicopter, ultralight, whatever. If it's buzzing around I have to see it - even if it involves walking out into the street for a clear view. 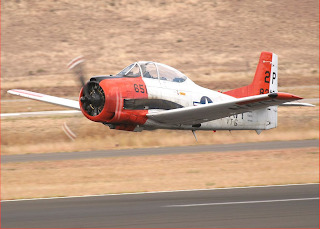 But I guess it's in my DNA as my dad was a pilot in the USMC. ...and then on to helicopter training. 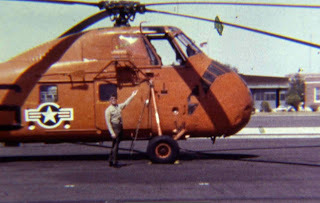 From the looks of the old Super 8 and the lack of original editing, he and mom checked out the next bird he'd be learning to fly - a TH-34 Sea Horse, the training version of the UH-34 utility helicopter. 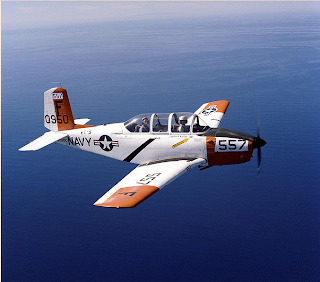 The old Super 8s had a nice little snippet of him flying a training mission over Southern California in '67-'68.. 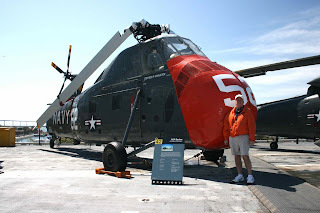 He'd later fly 34s for a tour in Vietnam. He wanted to continue flying after leaving the Marines, but at the time the airlines had more than enough pilots who were fresh from the service, so he used his valuable training to go into the retail sector and start working at Sears Roebuck & Co.
Once I was old enough to (loosely) fit into his flight suit and helmet, I'd dress up as a pilot for Halloween. I'm proud of my dad's flying career and only hope that I someday have the time (and more importantly, the money) to learn how to fly. Until then I'll continue to look up when I hear aircraft overhead - especially for military helicopters. In fact there's one flying down the coast as I type this.